The Web is the universal publishing platform. Publishing is increasingly impacted by the Web, and the Web increasingly impacts Publishing. Topic of particular interest to Publishing@W3C include: typography and layout, accessibility, usability, portability, distribution, archiving, offline access, print on demand, and reliable cross referencing. The Publishing Working Group made a significant technical decision for Web Publications: adoption of JSON-LD and the schema.org vocabulary, thus taking advantage of current Web practices in preference to the metadata vocabulary used in EPUB 2 and EPUB 3. Per their revised Publication schedule the group is about to commence work on EPUB 4. It is likely be a Packaged Web Publication relying on the OCF format used by EPUB 2 and EPUB 3. The current plan is to publish an EPUB 4 First Public Working Draft by the end of the year. The Publishing Business Group has coordinated significant updates to EPUB 3, done in the EPUB 3 Community Group. Notably, EPUB 3.2 is now available with full backward compatibility with EPUB 3.0 to ensure that EPUB 3.0.1 Reading systems would accept and render any EPUB 3.2 publication. 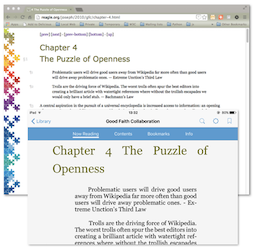 EPUBCheck is a crucial resource for a wider usage of EPUB 3. Further to a RFP for a concentrated effort on maintaining and developing the checker further, DAISY has been selected. The first goal is to add validation for EPUB 3.2 in early 2019. There is a fundraiser to pay the development team. The Publishing@ W3C Group notes that the web was created to provide access to a “universe of documents.” Since then, the Web has become many things, but documents and, by extension, publications, have remained close to the heart of the Web. Publishing at W3C wants publications on the Web to be more capable, more beautiful, more accessible, and easier. You can see more information and learn about the new scope of the work at the Group’s Publication Milestones. To learn how to become involved in this important work see the Publishing homepage.